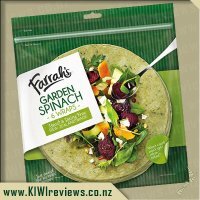 Farrah&apos;s Italian Herb Wraps contain a mix of roasted garlic and five classic Italian herbs - basil, oregano, rosemary, thyme and sage. Delicious filled with your favourite toppings for an easy lunch, they also make perfect thin and crispy pizza bases! 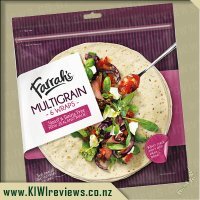 Each Wrap is visibly soft and smooth, and can be used in a variety of tasty recipes - whether filled, folded, wrapped, stacked or baked, Farrah&apos;s have your next meal sorted! Contains gluten. This product is manufactured on equipment that also produces products containing sesame seeds and soy. 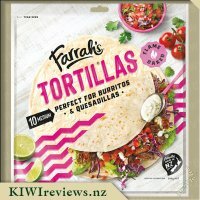 I have been a huge fan of Farrah&apos;s wraps since discovering them through KIWIreviews a few years ago now and have been buying them weekly ever since. 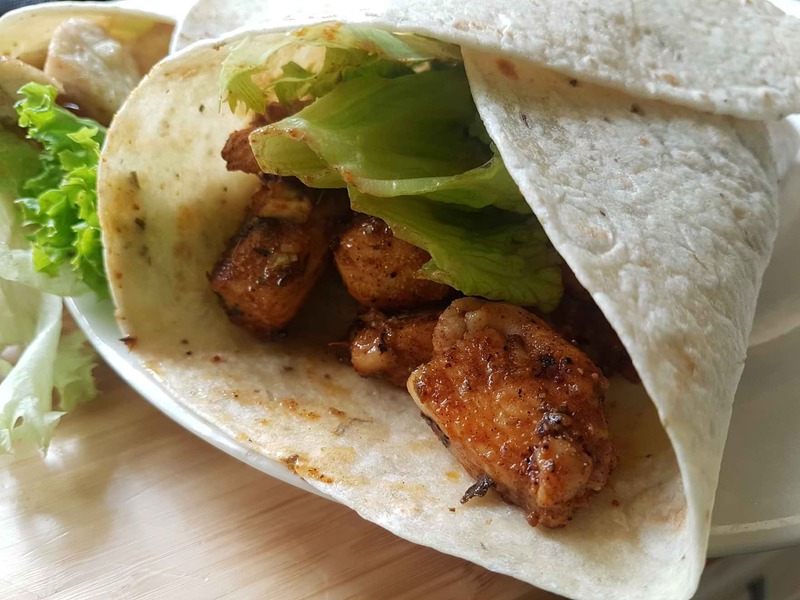 We do have wraps regularly in our house I find them so much less heavy than a sandwich and they are so versatile in that you can use them in so many different dishes and in so many different ways rather than as a base for a wrap style sandwich. We have tried pizza bases, home made tortilla chips, taco bowls, and quesidillas to name a few. 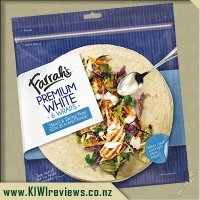 My favourite thing about Farrahs wraps is that they deliver on their promise that they wont crack or split! 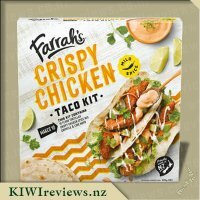 I always get excited when I see new flavour varities become available and Farrah&apos;s have quite the extensive range now. 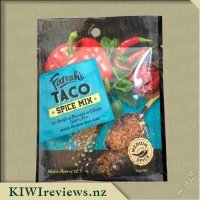 I was keen on the italian herbs to try these as home made pizza bases as my family love thin and crispy bases and with additional herbs baked right into the tortilla they already have the italian taste. 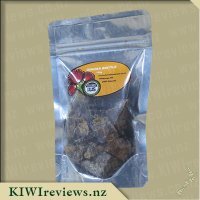 As soon as I opened the packaging the herb smell hit my nose you could definitely tell the flavour of the herbs was already there. 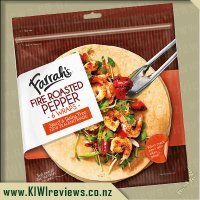 I loved the taste also as I had to try one as a wrap to get a good taste of the flavouring before using the rest as pizza bases. 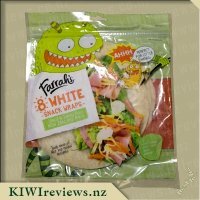 These wraps will definitely be a variety I buy again in the future its getting harder and harder to choose a farrah&apos;s variety with all the appealing varieties now available. 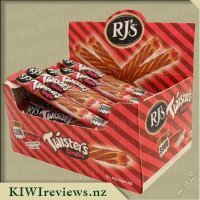 These were a hit with the family so will for sure be right up there along the list to choose from on supermarket shopping day. 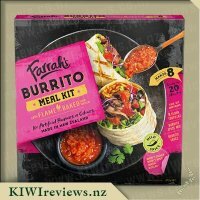 We are definitely a family that enjoys wraps, in all shapes and sizes, so when the chance to review some different flavours came up, I jumped at the chance. 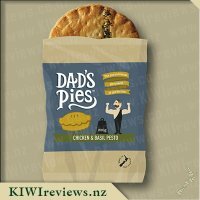 My children were very excited to see them in the review box and immediately wanted to know what the flavours were of the two that we received. 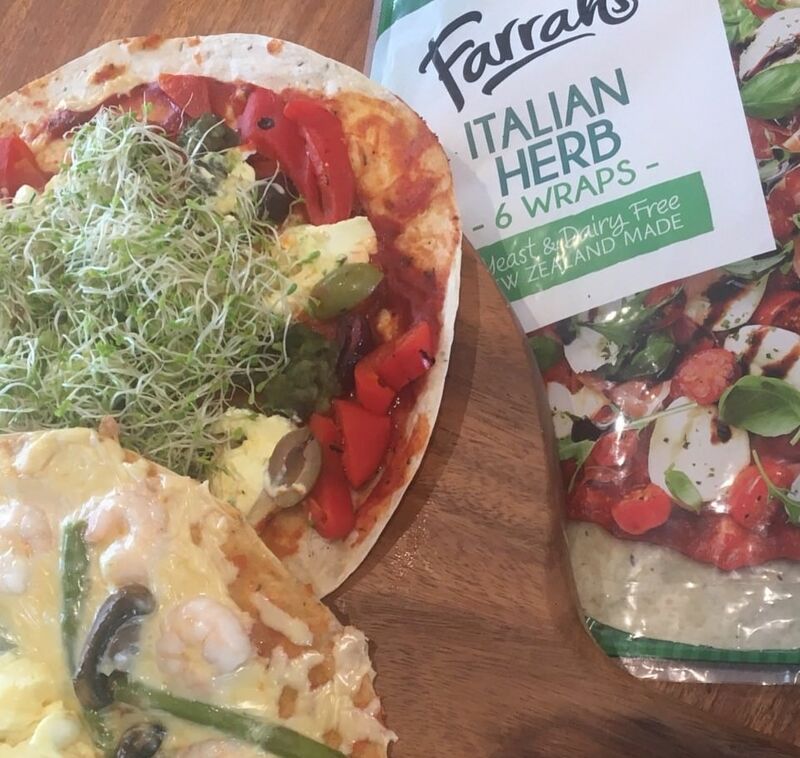 When you look at the Italian Herb wraps alongside some of the others - Farrah&apos;s have done a great job of making all of the packets look very different, with a colour that matches the flavours in some way. 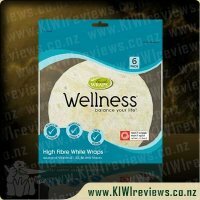 Each packet contains 6 wraps and proudly states that they are Vegetarian,Vegan, Halal Certified, Dairy and Yeast Free, and tells you that they are produced where they also produce products that contain sesame seeds and soy. This is fantastic information for anyone that has allergies themselves, or a family member that has dietary issues. 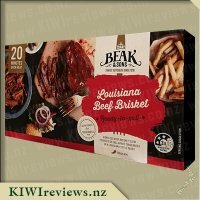 Opening up the wraps was very easy, and I noted that they have a resealable packet which is always good if you are not planning to eat them all in one go. The smell of the herbs was definitely there, and reminded me of a pizza, which was actually what was pictured on the front of the packet. I decided to try it without anything on it to start with to taste the full flavour. Biting into it, I noted it is a lovely soft wrap, of a very good size. It rolls well and is nice and flexible so does not seem to split or crack like others can. 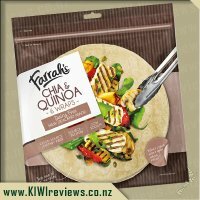 The flavour is very subtle in this wrap, and I was a bit surprised as the smell was very flavoursome. It was definitely a good taste, and for children it would not put them off eating it, where if it was stronger they are more likely to. We also tried putting these into the oven after making them into little pizzas and found although they are thin, they are very strong, and definitely good to use for that. The Farrah&apos;s wraps are definitely of a higher quality, which also means you do pay more, but for the extra you eliminate the dreaded "fall apart" "contents roll away" "sauce drip onto my clothes" scenarios - so it is definitely worth it! I also found that I (with a sensitive stomach and gut) was able to eat these with no problems, so definitely a good alternative to bread. 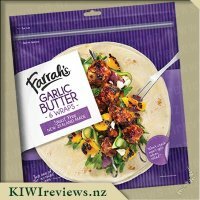 Well done Farrah&apos;s - I am going to try toasting them next with a little cheese and garlic - in a garlic flatbread type way, so wish me luck! Recently our family has decided to try to eat healthier than usual and to experiment with new flavours. 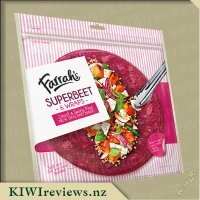 I love the fact that wraps are able to be customised to different people&apos;s tastes, when I saw that Farrah&apos;s had recently released a new range of wraps, I knew I had to try them. I requested to try the Italian Herbs flavour as I thought my children would prefer that, thankfully we were lucky enough and received a packet to try. 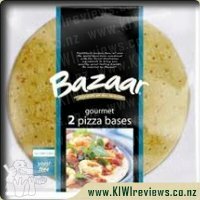 When I looked at the front of the packet, I admired the delicious looking pizza on the front, to be honest I had never thought to use wraps as pizza bases. 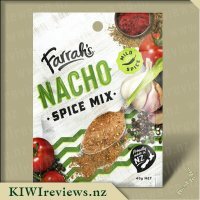 There is no mistaking that this is a Farrah&apos;s product as the brand name stands out, the Italian Herbs is written clearly just underneath. The packet provided 8 wraps which are yeast and dairy free, and apparently these are supposed to not crack or split when rolled up. At first when I turned the packet over to look at the back, I thought it looked quite busy, however when I took some time to read I was impressed. 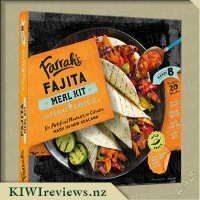 Along with the nutritional information, Farrah&apos;s have included their background story, a &apos;no rules recipe&apos;, and another serving suggestion. After much contemplation, I came to the conclusion that I wanted to put the wraps to the test, and see how they would go as pizza bases. The toppings that were used were pizza sauce, bacon, chicken, bbq sauce, tomato sauce, mushroom, red capsicum, tomato, onion, and grated cheese. Once in the oven I kept a close eye on them to make sure they didn&apos;t burn. When it was time to eat, my children and I were excited because the smell that greeted us was mouthwatering. 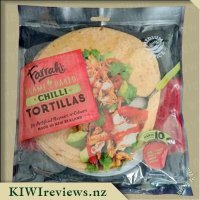 The wraps were easy to cut through, tasted delicious, and I was suitably impressed at how wonderfully the product performed as a thin pizza base. By the end of the night there were only a few pieces of leftover pizza - I think that shows they were a success. 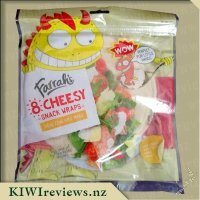 I will most definitely be purchasing this product again, if not to use for wraps then most certainly for pizza. 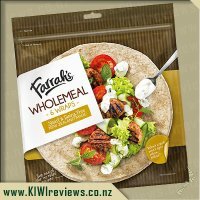 The herbs in the wrap add another flavour, I am intrigued to try more of the Farrah&apos;s range of wraps. I have to admit that we are a Farrah&apos;s wraps loving family and my daughter has a Honey and Wheat wrap for school everyday. One of the things that I really like is that they don&apos;t crack or split when rolled and you can tell the difference between them and the generic branded wraps. 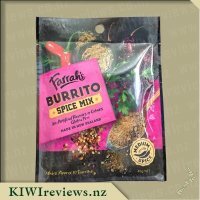 The Farrah&apos;s Italian Herb Wraps come in a resealable bag which is very convenient and the first thing I noticed when I opened the wraps was the gorgeous smell of basil and oregano. They smelt so lovely and fresh I was almost tempted to eat one out of the packet but my girls had moaned that they were hungry and I decided to make a quick and easy pizza with these using pasta sauce and cheese. 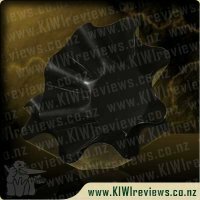 I had recently been given an air fryer which was perfect as my oven had broken and the wrap fitted in the tray with millimetres to spare! 5 minutes later, yes, you read that correctly, 5 minutes later the pizza was ready. When my girls looked at it they asked what the base was but seemed nonplussed when I told them and then devoured the pizza. My eldest said it was &apos;soooooo nice&apos; and my youngest said it was &apos;really, really nice&apos;. My eldest said the herbs tasted great which was surprising as she is the one that doesn&apos;t like herbs on her pizza! I must admit I did prefer the herb flavour in the base of the pizza and not on the top. Needless to say the pizza was eaten quicker than it took to make and when I asked if they would like another one I was met with a resounding &apos;YES&apos;! The wraps were light but crispy around the edges and the pizza was one of the nicest ones I&apos;ve tasted with a &apos;bought&apos; base. 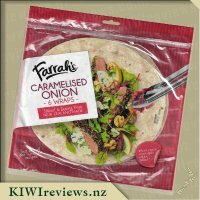 One of the things I love about Farrah&apos;s wraps is their versatility and I&apos;m sure these wraps would also taste gorgeous grilled with a sprinkling of garlic and cheese on top. 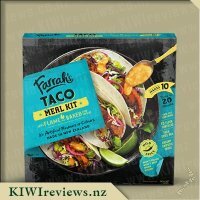 I&apos;ll definitely be buying some more packs as they&apos;re great to have on hand when you need a quick snack and at less that $1 a wrap, they&apos;re a bargain! 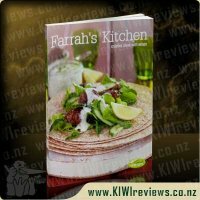 While Farrah&apos;s wraps do have a fair amount of calories compared to some other brands, it is without a doubt that Farrah&apos;s wraps have a consistently higher quality. with a good consistent size, that you can roll and fold without fear of the wrap tearing (unless you store them in the fridge at which point you need to ensure you warm them slightly). 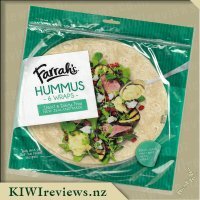 Coming in a resealable packet, these wraps are ideal compared to breads which struggle to maintain their softness a day after being opened. The wraps can stay fresh for well over a week. 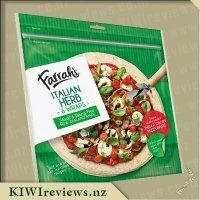 These Italian Herbs wraps are very similar to the others in the range, in that the flavour is very subtle. 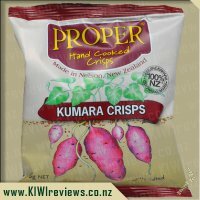 When you open the bag the smell is rather strong, but when you bite into one, the flavour is much less pronounced, with just a slight herb presence and a little overall sweetness to the wrap. Visually, you can see the herbs in the wrap, but flavour-wise it reminds me of the green/herbal teas; all smell, and minimal flavour. Apart from eating the wrap plain to discern the strength of the flavour, I also decided to make some chicken wraps, and some quesadillas. The chicken wraps were very simple, and even without heating the Italian Herb product, the wraps did not tear, and held in the juices and sauces very well. Even when it cam e to cooking the quesadillas, the wraps did not tear or stick when placed directly on the pan without oil or butter, and then allowed the filling to warm up without the wrap burning, which was great. 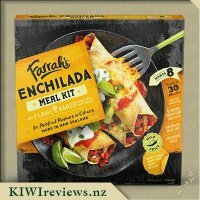 While it worked well for a quesadilla, I do prefer more of a crunch, so I would be tempted to lightly grill the inside side of the tortilla before flipping and adding my contents, just to make it crispier, and less "soggy". While a calorie-rich wrap, they are still a vast improvement over breads and burgers, and the versatility of the product is unbeatable. The Italian Herb product adds to these characteristics by adding a subtle savoury flavour that fills the void that a plain, flavourless wrap or tortilla would have, providing a more more full-bodied flavour to every bite (regardless of how much filling you get in each bite). 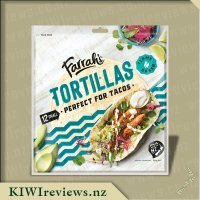 It is no secret in our family that Farrah&apos;s is the default brand we look for when we are shopping for wraps. 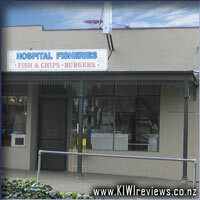 The quality is consistently good, so we know what we are getting. 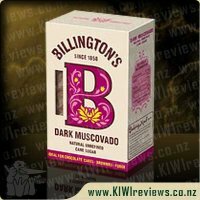 This new flavour lived up to our expectations too, and as a bonus the children declared after one sniff that they knew they were going to like it. We made pizzas with five of the six wraps - that was, one apiece. Instead of preparing five identical pizzas, I put a selection of toppings into bowls and let everyone build their own. This appealed to the children, although Miss Six had to be told she could not have all the pineapple - she needed to leave some for the rest of us and maybe put something else on hers as well. But apart from that, the children thought it was a great way to have pizza and, as they had prepared their own, there were no protests when it came to eating it. Included among the topping choices were precooked vegetables like asparagus and mushroom, prawns, two different kinds of grated cheese (mozzarella and cheddar), tomato paste, chopped olives, crushed pineapple, fresh salsa, sliced tomatoes, and some leftover chopped ham and capsicum. To garnish, once the pizzas were ready, we had alfalfa and sliced avocado. The pizzas were ready within minutes and lived up to expectations. My daughter lifted one from the oven tray to a plate using only her hands, and the wrap kept its shape perfectly. There was no splitting or spilling of the contents even though it was one that Miss Six had built with a huge pile of toppings! 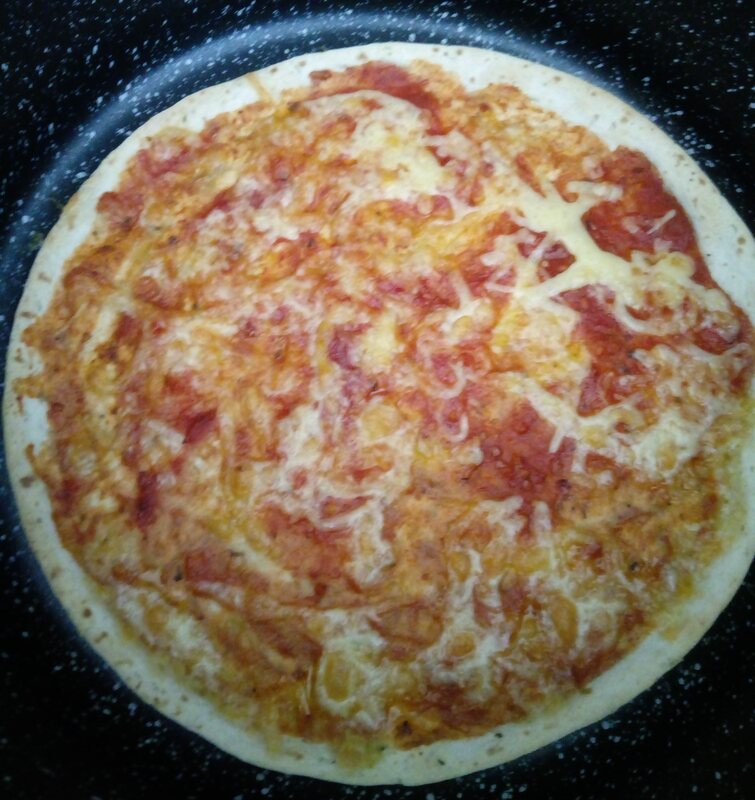 The packet did advertise that the product was suitable to use as pizza bases and was guaranteed not to split or crack, but somehow we did not believe that till we saw it for ourselves. 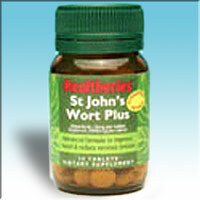 The actual herb flavour was quite mild, unlike the impression we had when we first removed the wraps from their packet. Mr Eight, who has very sensitive taste buds, said he could just recognise a hint of the herbs, but the rest of us could not. 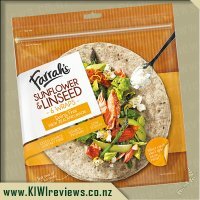 I think if I were using these particular wraps again I might add another pinch of dried Italian herbs to each pizza so that the flavour was more pronounced. At the same time, we had all piled on quite a variety of toppings, so it is possible that we just masked the flavour. Fewer ingredients might have allowed it through. And one each was plenty; Miss Six could not finish hers but the rest of us ensured that none was wasted. I took the remaining wrap home with me and made a roll-up for next day&apos;s lunch. I was planning to meet a friend at mid-day for coffee so I cut the prepared wrap in half so that she could evaluate it too. We got takeaway coffees and went to the park to enjoy them with the wraps. 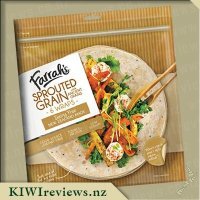 I had used salad sprouts with cottage cheese and mashed hard-boiled eggs as the filling - one of my favourite combinations and one that holds together in a wrap; she is vegetarian, so I knew this would be fine. A few hopeful birds were hovering, waiting for the inevitable crumbs. They were out of luck! This time the herb flavour was quite strong and delicious, so we ate every last bit ourselves. And crumbs? No - these wraps don&apos;t split, and they don&apos;t generate crumbs either. Sorry, birds - but the two humans enjoyed them! Pesto, it&apos;s the best-o! We stir tender chicken and capsicum through a lovely dollop of pesto and sprinkle on tasty Parmesan cheese.